Fear is a thief. It will steal your life from you. It will turn your life into darkness. Reducing the bright light that should be shining within you into a dull candle like the image above. Fear feeds fear. That is what FEAR stands for. False, evidence, appearing, real. It is not truth and is a figment of your imagination. Fear stops us from living life to the full, it stops us from loving others, stops us from pursuing our dreams, stops us from doing a job that we love, stops us from leaving unpleasant jobs, stops us from be ourselves, stops us from being successful, stops people from even leaving their homes. It manifests in so many ways and is fed to us as a daily diet by media and everyone around us. There’s dangerous strangers, foods, diseases, jobs, foreign countries, political leaders, political parties, teachers,schools, neighborhoods,beaches, sun, meteors, and on and on. Fear is evident in people that criticize and judge others and those who seek power and even in the need to be right in a argument. Fear can be so strong at times that it appears real. It is not. 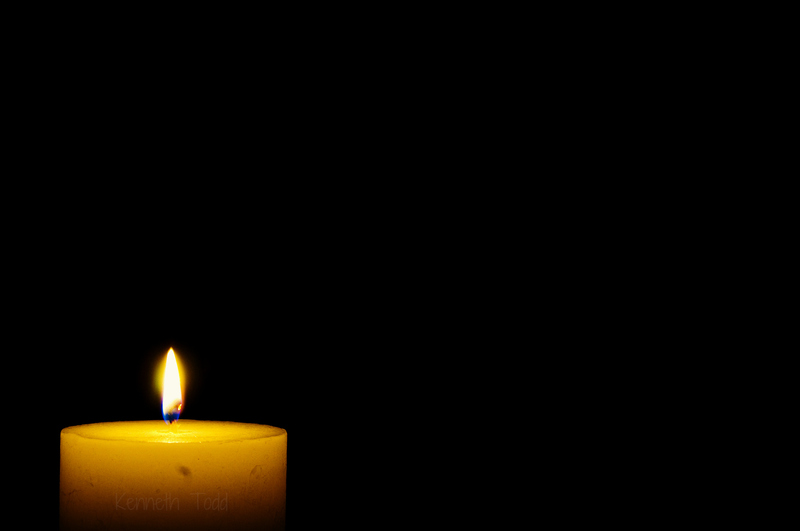 Just like that little dull candle burning in the photograph, being enveloped by darkness, there is only one thing that can change that…..Turning on the light! Darkness cannot prevail when light is shined upon it. Fear cannot exist when the truth is revealed. Face your fears today and shine the light of truth on it and begin living. Be yourself and live fearlessly. So well said. Perfect photo for this piece. Enjoyed this post and the photo. Love this message and the image is haunting. Great job. Excellent post. Thank you for sharing. The photo definitely speaks to what you say. Thanks for comments Sharon, appreciate it. Thank you. It has same effect on many of us. I overcame that a while ago after was forced into a position with poor health. Fear no longer drives my work choice. Again, tks for comments, appreciate it. Great shot … great words … but what I like the most is your signature on the photo !! very well done ! Thanks. Didn’t think anyone would notice. Really appreciate this post! Photo illustrates it perfectly! nice use of negative space….Lovely photo.